“The third paramitā trains us to be steady and open-hearted in the face of difficult people and circumstances. Patience entails cultivating skillful courageousness, mindfulness, and tolerance. In general, when we feel that others are hurting or inconveniencing us, we react with various forms of anger and irritation, instantly looking to strike back. When it comes to the paramita of patience, however, we remain as unwavering as a mountain, neither seeking revenge nor harboring deep resentment inside our hearts. Patient tolerance is a very powerful antidote to anger. The three categories of patience are (A) patience with enemies, (B) patience with hardships on the path, and (C) patience with the ups and downs of life. (A) Here we must learn to tolerate three types of enemies: those who are stronger than us, those who are weaker than us, and those who are equally strong as us. Towards enemies we cannot overcome, we avoid harboring jealousy or resentment; towards enemies we can overcome, we avoid cruelty; and towards enemies that are our equals, we avoid endless competition and squabbling. (B) It often happens that no matter how faithfully we perform all the practices on the path of Dharma, we feel like we have achieved nothing. We are so focused on the idea of gain—the goal of enlightenment—that we become discouraged, frustrated, and tired when we begin to realize the difficulty of actually attaining it. To cultivate the patience necessary to eventually realize buddhahood, we must focus instead on compassion for others, while continuing to perform our practices without expectation of immediate results. Photo of Ven. 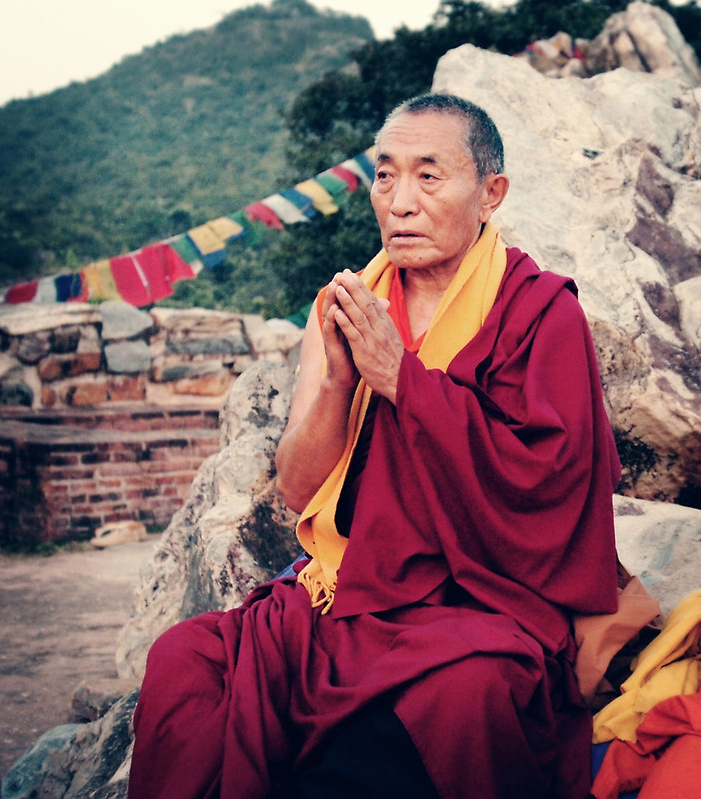 Khenchen Palden Sherab Rinpoche praying at Vulture peak Mountain in Rajagriha, India in 2006 by Djamilla.